CCVS - Companion Animal Clinic NOW OPEN!! Christian County Vet Service is proud to announce that our new companion animal clinic is now open. There are many service provided for our small animal friends. See the 'Services' Tab for a complete listing. We are here to serve your companion animals and look forward to servicing you. Katie Loula DVM and Cherie Gregory DVM are our new companion animal veterinarians. The large animal haul-in facility is a state of the art facility featuring drive in unloading, many individual pens, indoor treating area including a Silencer chute. This facility has a large barn that will house large animals with multiple pens, chutes, and appropriate equipment for the best care of our large animal clients. CCVS looks forward to helping you meet even more of your veterinary needs! Call 417-743-CCVS (2287) to make your appointment today. 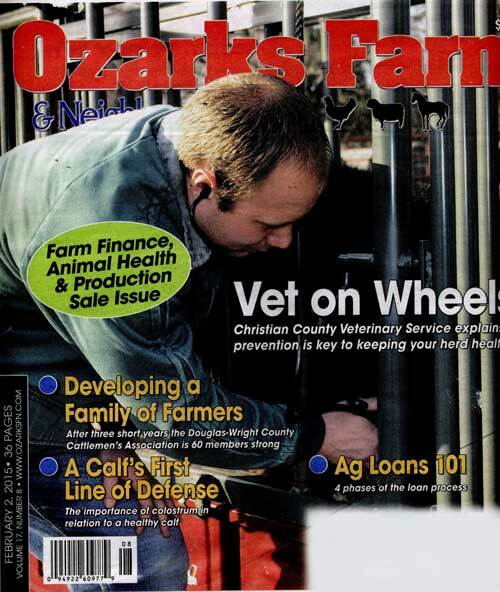 CCVS was featured in the Ozarks Farm & Neighbor Magazine February 2, 2015 issue. Click on the image or here to read full article.